Easy moist and fluffy Mini Cheeseburger Muffins include the best parts of a cheeseburger baked into bite-size muffins. Parties and football food, a big part of what fall and the holidays are about. We can’t forget comfort food either; hearty food that warms you up anytime and puts a smile on your face. These Mini Cheeseburger Muffins are a perfect cure for those chilly nights. Comforting little morsels of cheeseburger you can eat by hand and are easy to prep and take to parties. Bring this to your next gathering and guests will be swarming to them. Greek yogurt – although this ingredient isn’t usually found in cheeseburger it gives a lot of flavor tot he muffins and helps stop them drying out. I used sharp cheddar cheese with lean ground beef to create moist, tender savory meat muffins. This wholesome recipe packs plenty of flavor and protein. 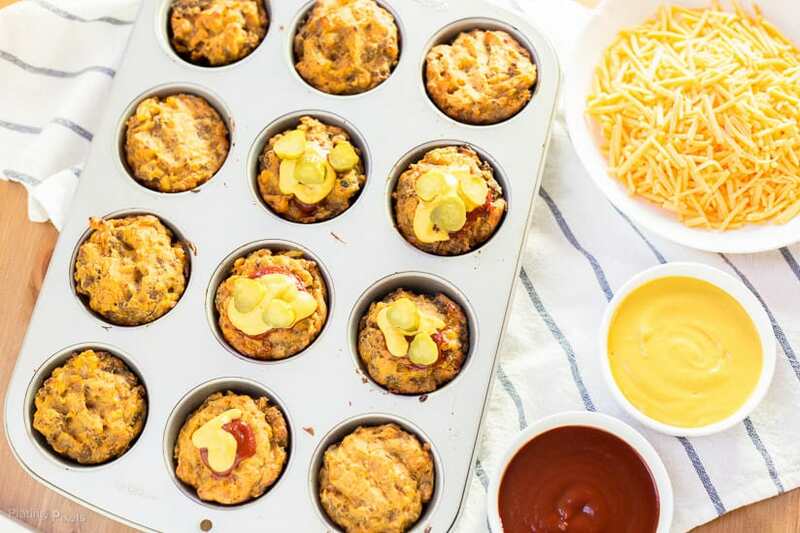 A couple of cups of cheese in the entire recipe is a balanced way to create cheeseburger flavor in these mini muffins. 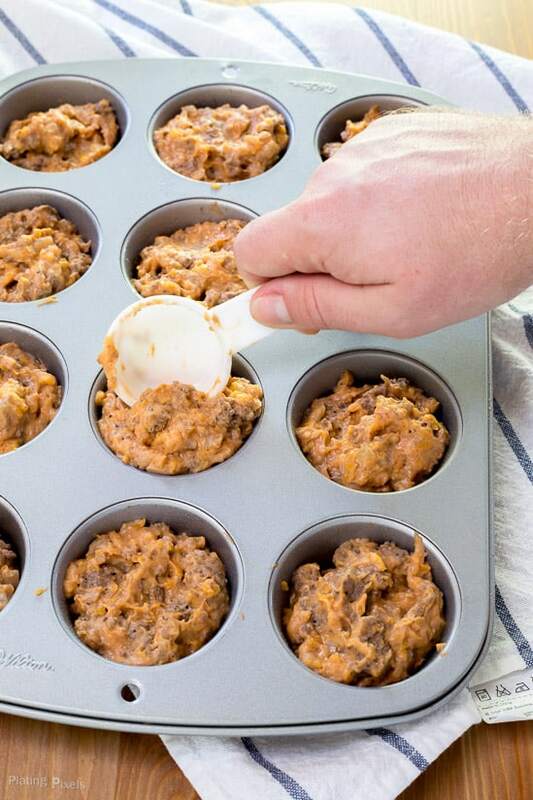 To keep these from being meatloaf muffins, it’s mixed into a batter that mimics bread from a cheeseburger. Mix in a couple of eggs, onion, a bit of butter, flour and baking powder to make a simple dough that fluffs these cheeseburger muffins into moist mounds of ready-to-go cheeseburgers. Plus it’s got the ketchup and mustard baked right in, of course, you can garnish with more. In a large pan or skillet stir together beef, onion, pepper, and salt. Cook over medium-high heat until browned. In a large bowl, combine flour, baking powder, and salt. 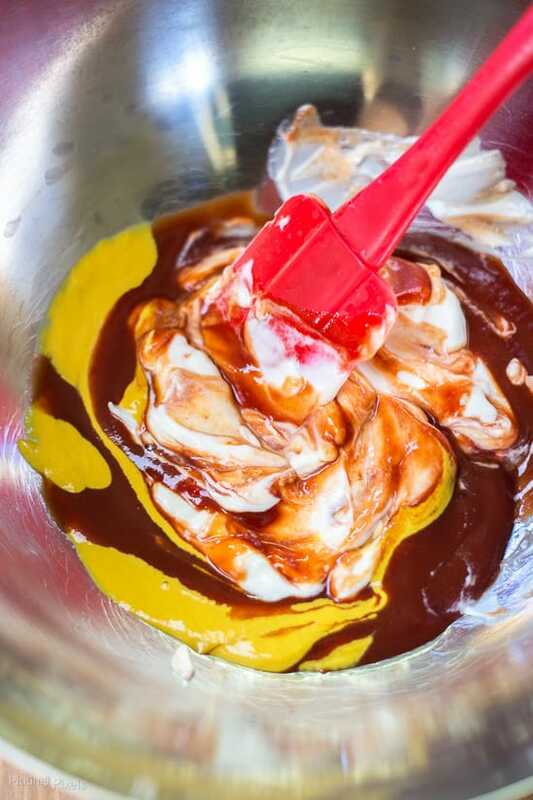 In a separate medium bowl combine ketchup, mustard, eggs, yogurt, butter and Worcestershire sauce. Stir wet ingredients into bowl of dry ingredients until moist. Fold in beef mixture and shredded cheese. Fill greased muffin pan cups almost full with mixture (it won’t rise much). Bake until cooked through and a toothpick inserted comes out clean. Top with more ketchup, mustard and sliced pickles if desired. These mini cheeseburgers are very versatile so it’s a fun way to get creative and try different toppings and seasoning. Why not try topping with bacon pieces, fresh chopped tomatoes or mix in different herbs into the mix. Like a little heat? try adding fresh or dried chili. This is a great thing to do at parties when you want to serve up different varieties or even get the guests making their own! Flavor profiles: Meaty, rich and savory, with a bit of tang from mustard and ketchup. Texture: Moist, tender and fluffy cheeseburger muffins. Easy moist and fluffy Mini Cheeseburger Muffins. Ground beef, cheese, ketchup and mustard with batter. Best parts of a cheeseburger baked in a muffin. Preheat oven to 425º F. In a large pan or skillet stir together beef, onion, pepper and ½-teaspoon salt Cook over medium-high heat; 5-7 minutes until browned. Drain excess liquid and remove from heat. In a large bowl, combine flour, baking powder and 1-teaspoon salt. In a separate medium bowl combine ketchup, mustard, eggs, yogurt, butter and Worcestershire sauce. Stir wet ingredients into bowl of dry ingredients until moist. Fold in beef mixture and shredded cheese. Fill greased muffin pan cups almost full with mixture (it won't rise much). Bake 16-18 minutes until cooked through and a toothpick inserted comes out clean. Cool a few minutes then remove from pan and serve. Top with more ketchup, mustard and sliced pickles if desired. Recipe looks great but I hate the taste of Worcestershire sauce with a passion. Can I leave it out or replace it with something? Hi Emily. It’s really there to enhance the meat flavor, so you can leave it out. If anything just add a tad more salt. These look great! I bet the would be great to put into my freezer for a quick lunch! Have to try this recipe out very soon! These can totally be frozen for easy leftovers. Thanks Haley! These look so delicious, the perfect bite sized treat! What a brilliant idea. I would never have thought of that. Kids will love these. Thanks Jacqueline and I guarantee they will! 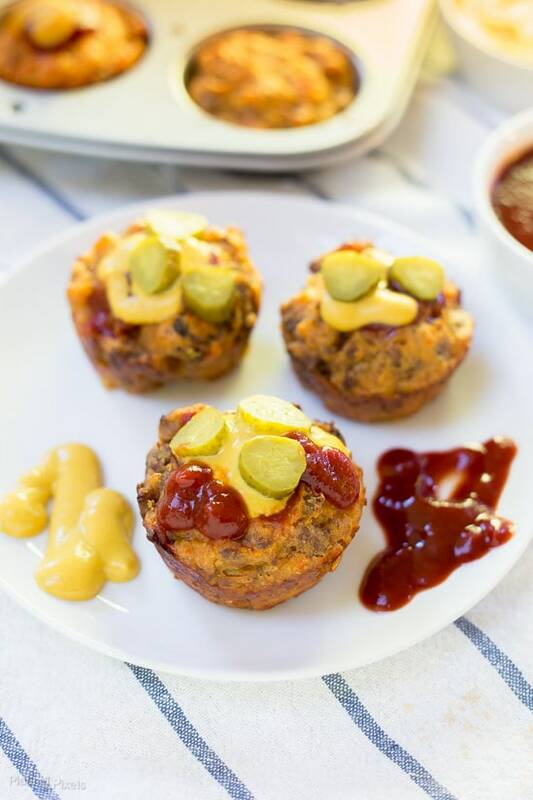 What a wonderful idea preparing burger in a muffin tin! I still do it the traditional way, on a grill, or a hot skillet on a stove-top, but this muffin version is so much hassle free. Thanks! Thanks Stephanie! That was the goal on this recipe, best of both worlds. I love childhood favorites and comfort food like this. Hope you like the recipe and thanks Renee! I will be making these for my daughters to pack in their lunch box. Pinning it! That’s so nice Jamie. I’m sure she’ll love them! This is such a great idea! A man muffin – my husband would love this! I don’t have any gluten-free flour on hand, but I am assuming I could sub in regular flour. I could also easily freeze these and save for when we are in a hurry! That should totally work and good point on freezing. I actually did that so I can enjoy the leftovers longer. Great recipe. It is easily PALEOIZED as well so that is awesome. 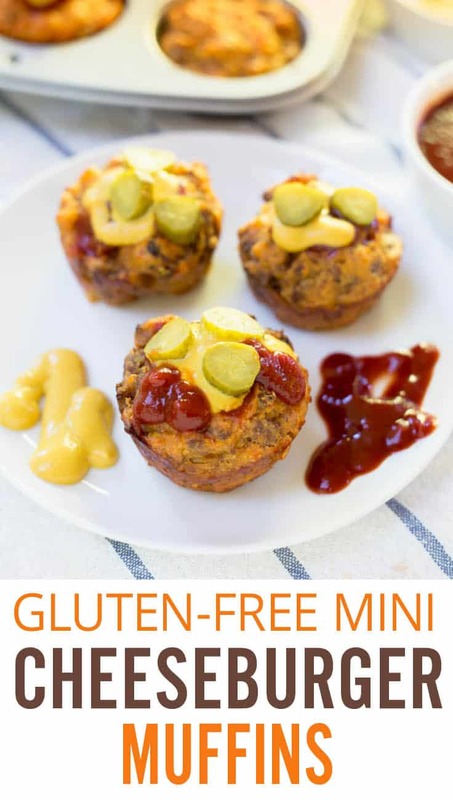 I love having meat muffins on hand for snacking! Thanks for posting this new twist on a meat muffin reipe. That’s good to know it can be easy paleo. Good idea Heather. One or two would be a perfect snack. I am so excited to try these. We make the egg muffins for breakfast already and I love those. My mouth is watering just looking at these. Savory muffins are the best. That’s the best kind of response. Thanks Nicole!